The end of the world. It could occur at any time, you know. It could come swiftly, and with an unbelievable amount of force. Think of the zombie pandemic as shown in 28 Days Later. Or the spiky climate chaos in The Day After Tomorrow, or even the hell-bent meteor trajectory towards Earth as seen in Armageddon. There are endless possibilities. But the main question is: when the end comes, would you be able to stop it? Perhaps not. But would you, as a human being, be able to rise above it and survive the apocalypse like a warrior like Mad Max? Definitely. How? By fortifying your home using the following upgrades, and turning it into a safe haven. Imagine yourself as a knight in the days of old. A major battle is afoot, laden with battle axes and pointed maces. How would you protect yourself from the blows? With steel armor, of course. 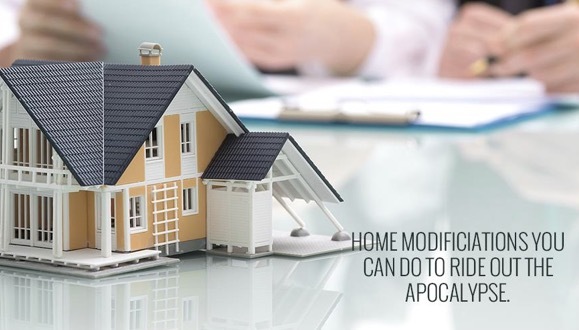 Similarly, by cloaking your home with a solid steel exterior, and reinforcing all the entry ways against external pressure, you’ll be able to withstand apocalyptic conditions. Take the movie I Am Legend, as example. The main character Robert Neville safeguards his home and himself against the vampire-like zombies by using automated steel slabs, which cover the dwelling like a shroud, thus ensuring ultimate protection. While you’re enclosed in a steel box, safe and secure from the severe apocalyptic conditions, you need to have eyes on the ground so you can know what’s going on outside. For this purpose, surveillance, using high-tech cameras like the ones provided by Vivint security, is necessary. Fix the cameras in tactical positions around your home, and you’ll see everything. Here’s another movie for reference: in The Purge, the Sandin family sets up top-notch security cameras in the area surrounding their house, which is under lockdown. This way, they can see if something horrible comes sprinting their way, amp up their defenses, and also find out when the chaotic night finally ceases. If the apocalypse is explosive in nature, having an underground bunker to wait it out is the best option possible. Once the surface gets too radioactive, a steel-lined chamber deep below the ground will be apt and flexible enough to last for years. It can be accessed through an air-tight, pressurized solid steel door, and can be descended into by staircase. For fresh air, a three-way filter unit can be engaged, which takes all nuclear, chemical, and biological factors into account. Take for instance, the bunker shown in 10 Cloverfield Lane. It is impressive in its veracity, though more fictional than practical. Still, it’s a complete survivalist haven, which you can add to your home. Once the apocalypse hits, basic necessities, like food and water, will die down. Everything will become bare and barren, losing their regenerative properties. In these extreme conditions, you would have to survive on remnants. If you’ve been tactical enough to store a sufficient amount of supplies beforehand, then you’ll do just fine. For food, you can store the preserved meats, canned vegetables, powdered proteins, and other non-perishables. Water and fuel will have to be bottled up, made air-tight, and saved for later. Add these to a secret shelf in the storage section of your home, and you’re good to go. For inspiration, see Howard’s survivalist supplies in 10 Cloverfield Lane. Backups are always handy. If your plan A fails, you can smoothly transition to your plan B. For instance, if your power goes out, having an emergency power-supplying device, like the 12-volt power system with a long-lasting, easily-recharged battery, can light up those dreadfully dark days. Other than this, a medical emergency kit should definitely be a YES. Anything might happen when you’re in survival mode. A flashlight is always a good resource, along with extra batteries. Use a radio too, to know what’s going on out there, or whether there’s someone else surviving out there, like Rick Grimes does in the zombie-infested Walking Dead series. Keep these emergency backups in easily accessible cabinets around your home, so you can find them like the back of your hand. With these practical home upgrades, you can ride out the apocalypse, and come out as a smart survivor.